Students will learn Creativity Skills and Digital Proficiency. Date: 20 Apr 19 | Daily News. MOU Signed between JECRC University and ADOBE. 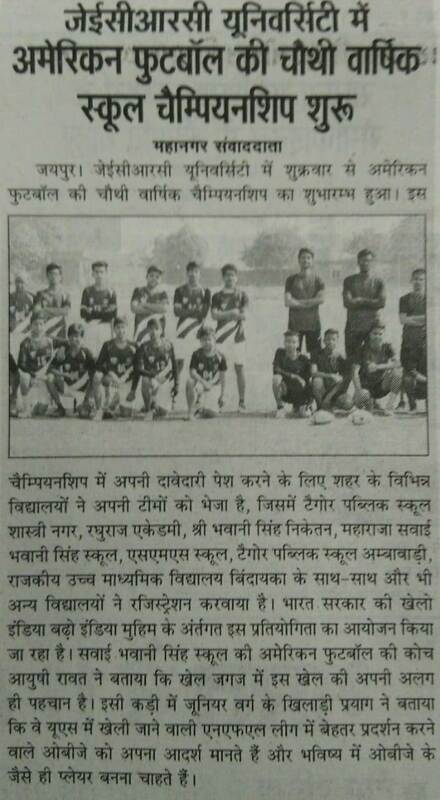 Date: 19 Apr 19 | Samachar Jagat. 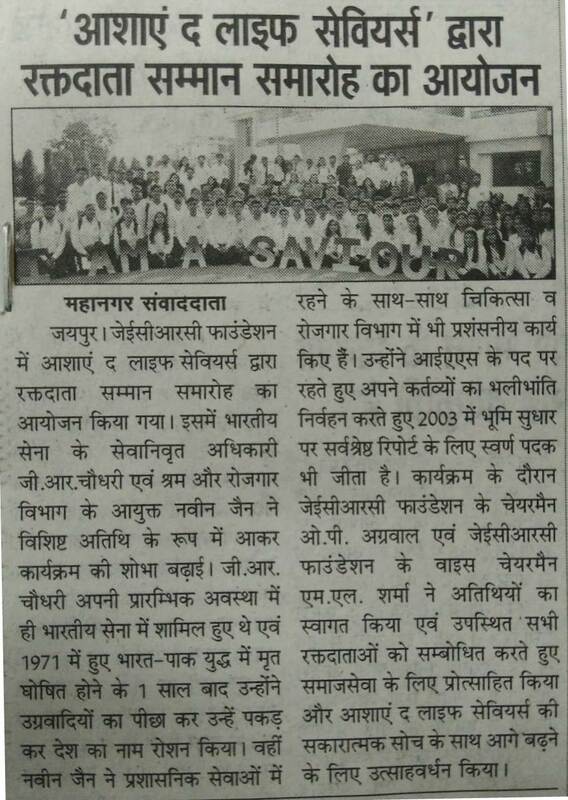 Date: 19 Apr 19 | Mahanagar Times. 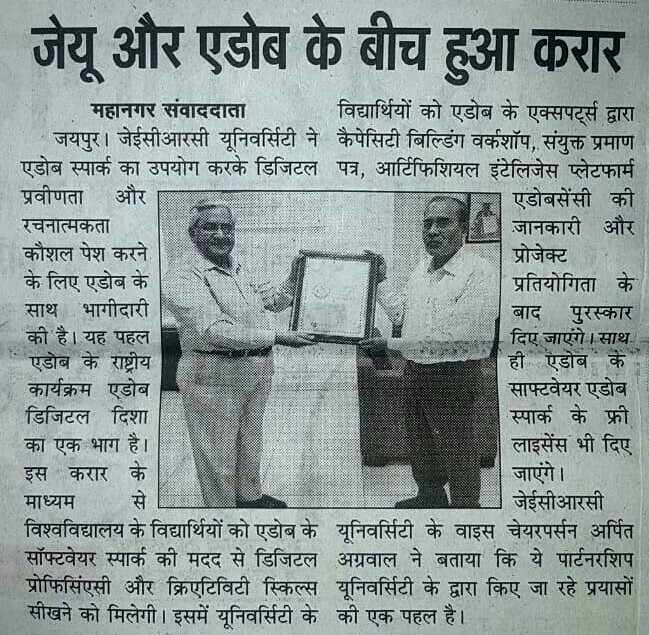 JECRC University got NAAC Accreditation. 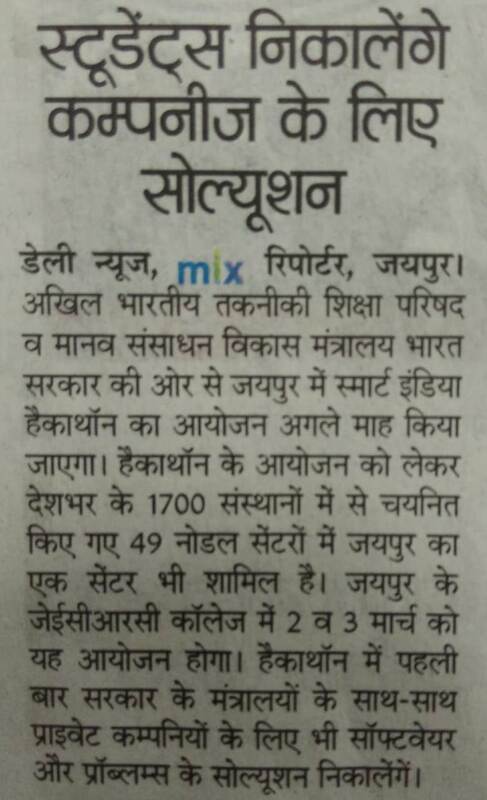 Date: 19 Apr 19 | Dainik Bhaskar. 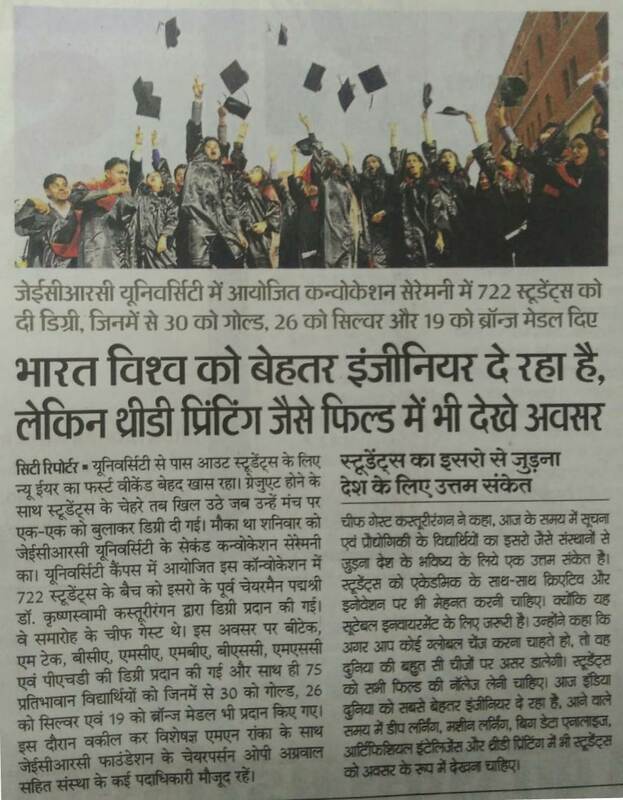 Date: 19 Apr 19 | Dainik Navjyoti. Date: 30 Mar 19 | Daily News. 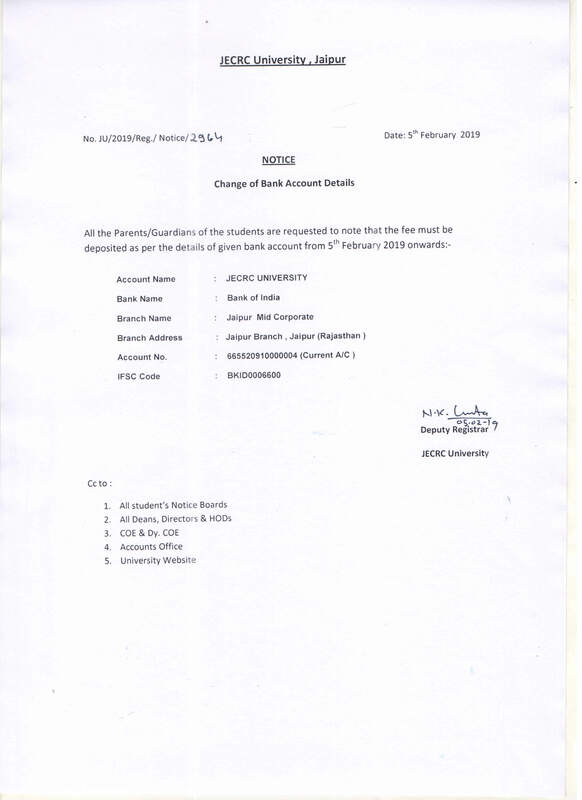 JECRC University and JECRC Foundation got NAAC and NBA Accreditations. 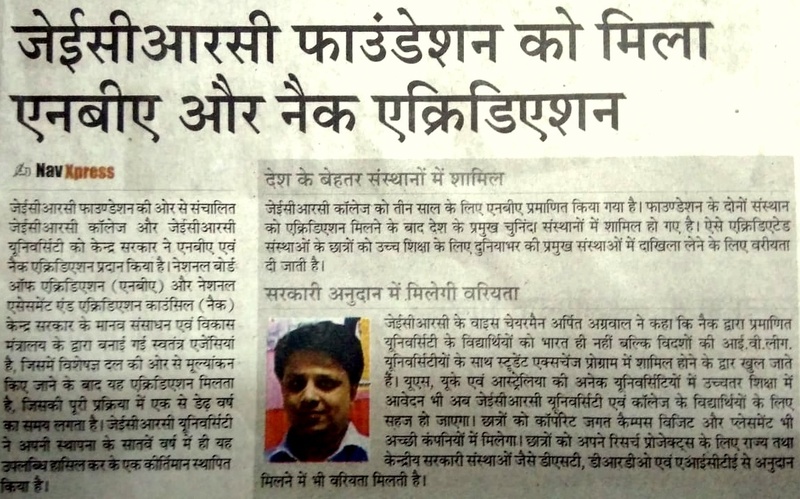 Date: 29 Mar 19 | Dainik Navjyoti. Before Admission, Students Seeks for Accreditations. Date: 29 Mar 19 | Daily News. 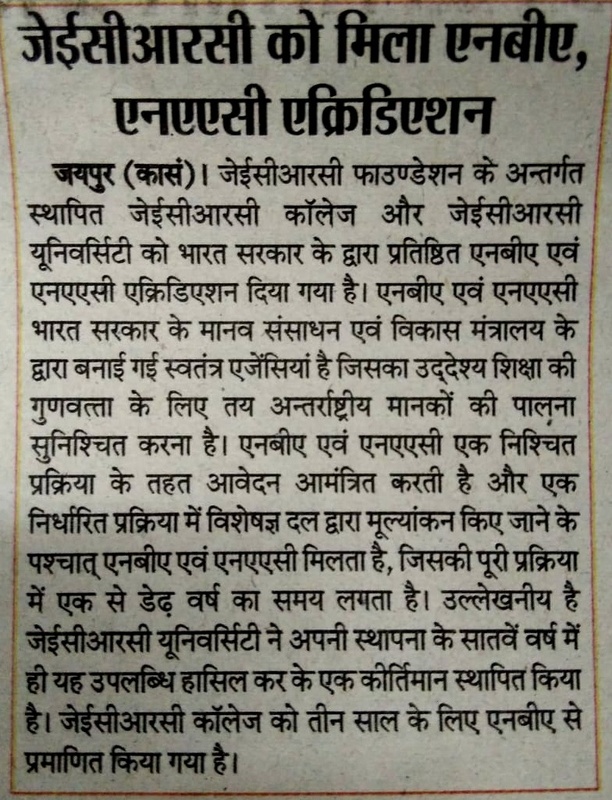 Date: 29 Mar 19 | Samachar Jagat. Date: 29 Mar 19 | Mahanagar Times. 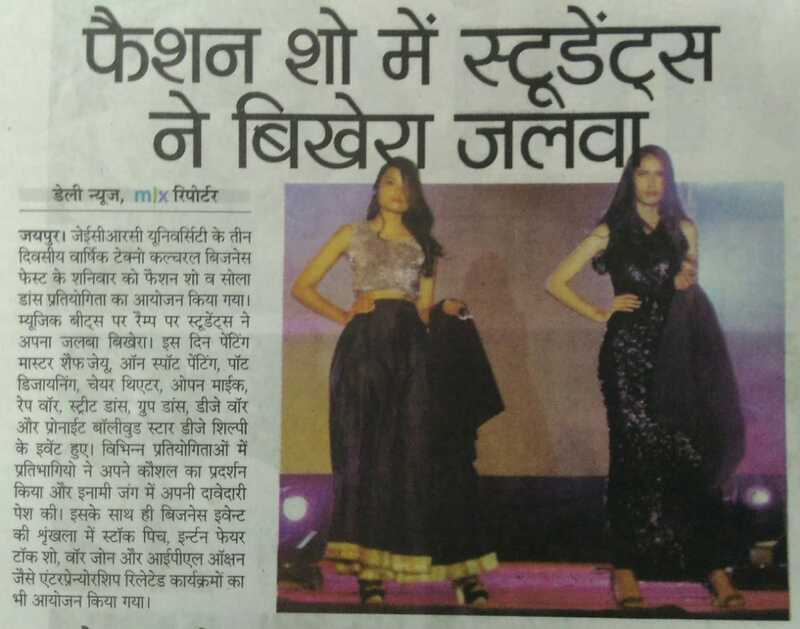 Ramp Walk Glamour Shown in Fashion Show in JU RHYTHM 2019 at JECRC University. 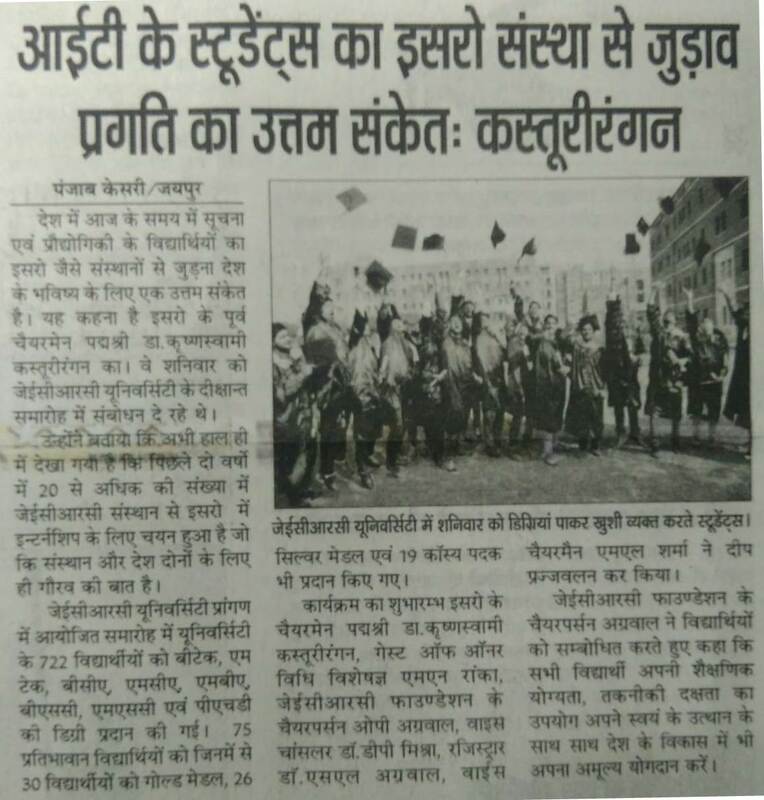 Date: 10 Mar 19 | Dainik Navjyoti. Students Spread their Glamour in JU RHYTHM 2019 at JECRC University. Date: 10 Mar 19 | Daily News. Heart Winning Performance in Ramp Walk, Robo War and Street Dance in Annual Techno Cultural Business Fest- JU RHYTHM 2019. Date: 10 Mar 19 | Mahanagar Times. JECRC University Annual Techo- Cultural Fest JU RHYTHM 2019 Started from 7th March. 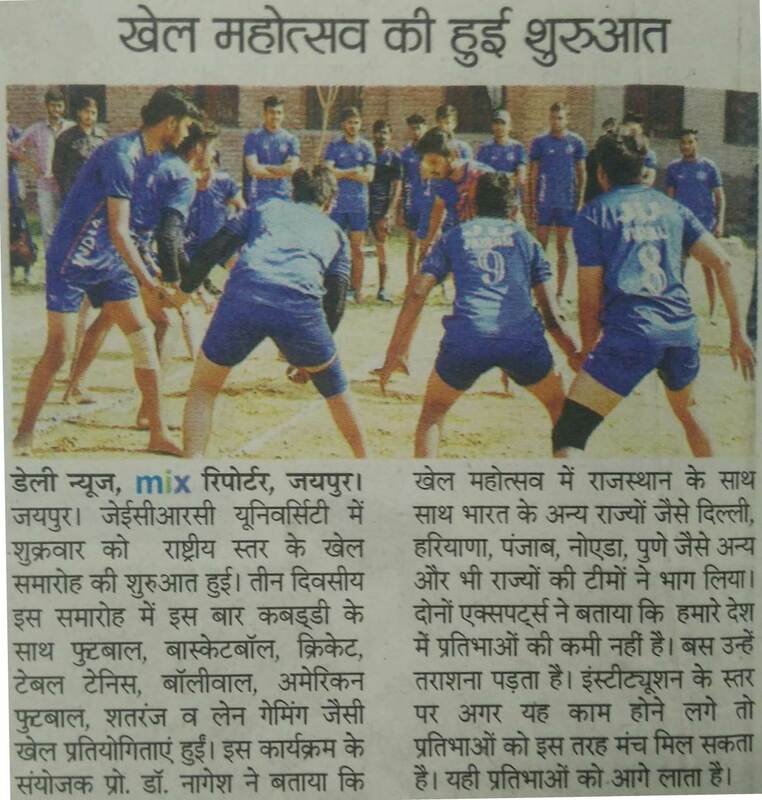 Date: 10 Mar 19 | Punjab Kesari. 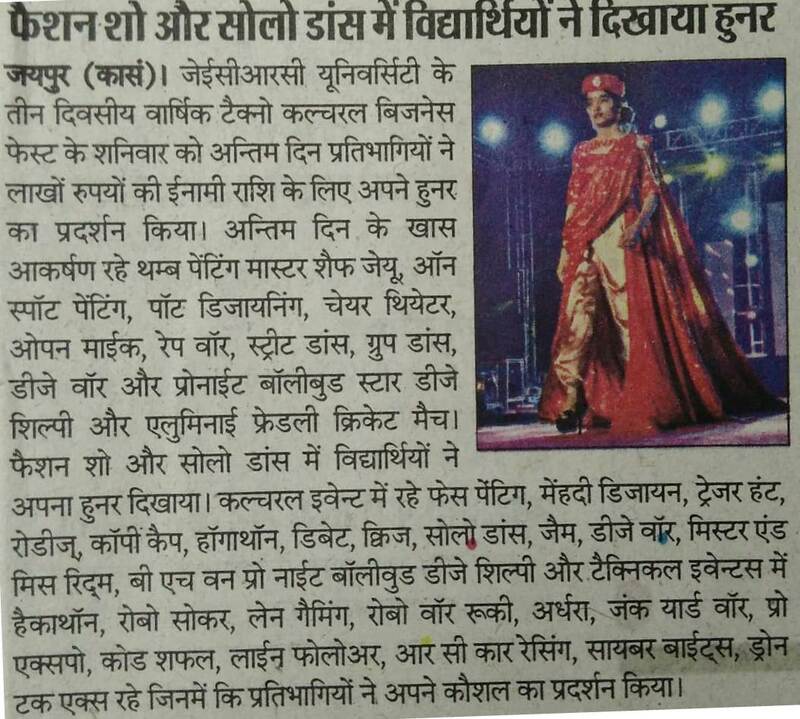 In Fashion Show and Solo Dance, Students Showed their Talent in JU RHYTHM 2019. 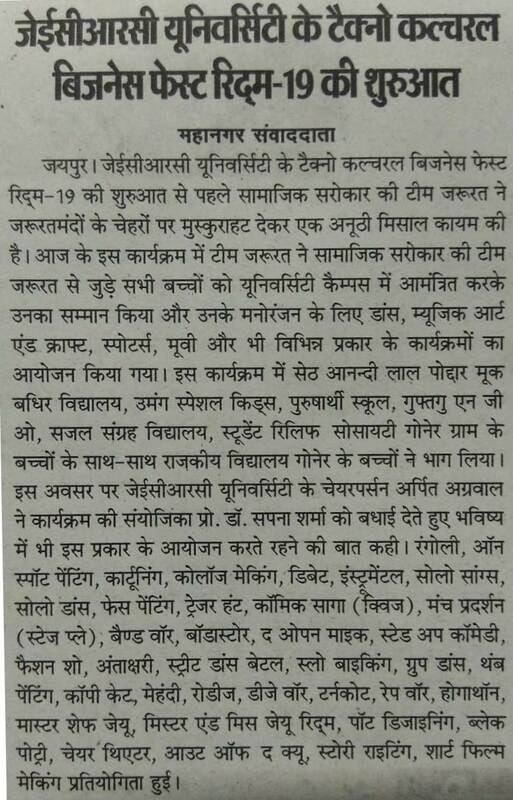 Date: 10 Mar 19 | Samachar Jagat. Techo- Cultural Fest JU RHYTHM 2019 Rocked at JECRC University. Date: 09 Mar 19 | Daily News. Fun and Joy Seen in JU RHYTHM 2019 at JECRC University. 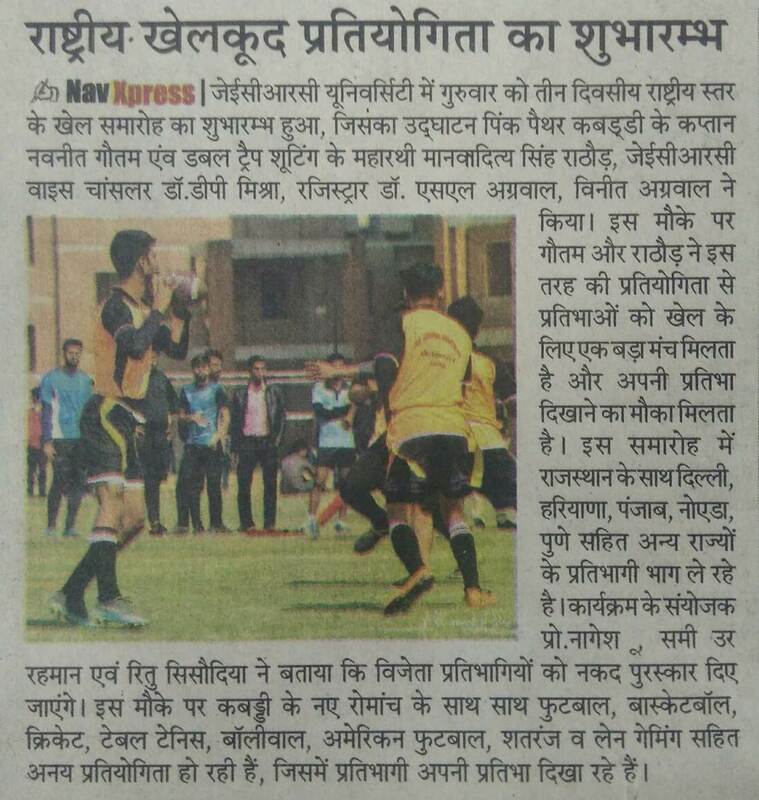 Date: 09 Mar 19 | Dainik Navjyoti. 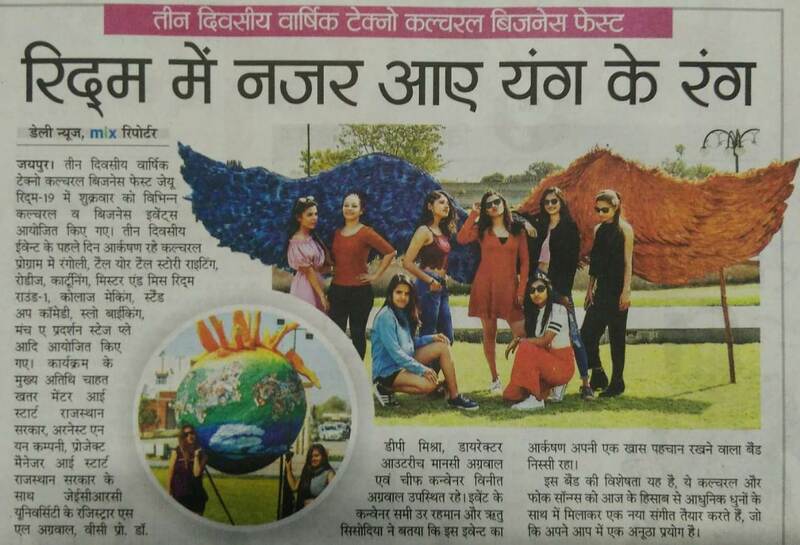 Design Students Prepared Coloured Wings from Papier Mache in JU RHYTHM 2019 at JECRC University. 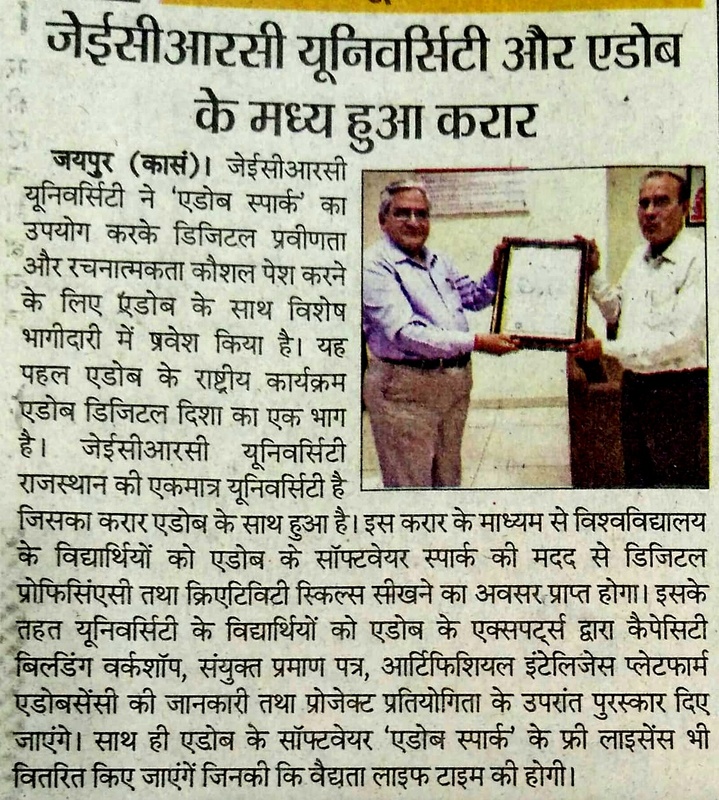 Date: 08 Mar 19 | Dainik Bhaskar. Students Showing there Talent in Annual Techno Cultural Business Fest- JU RHYTHM 2019. 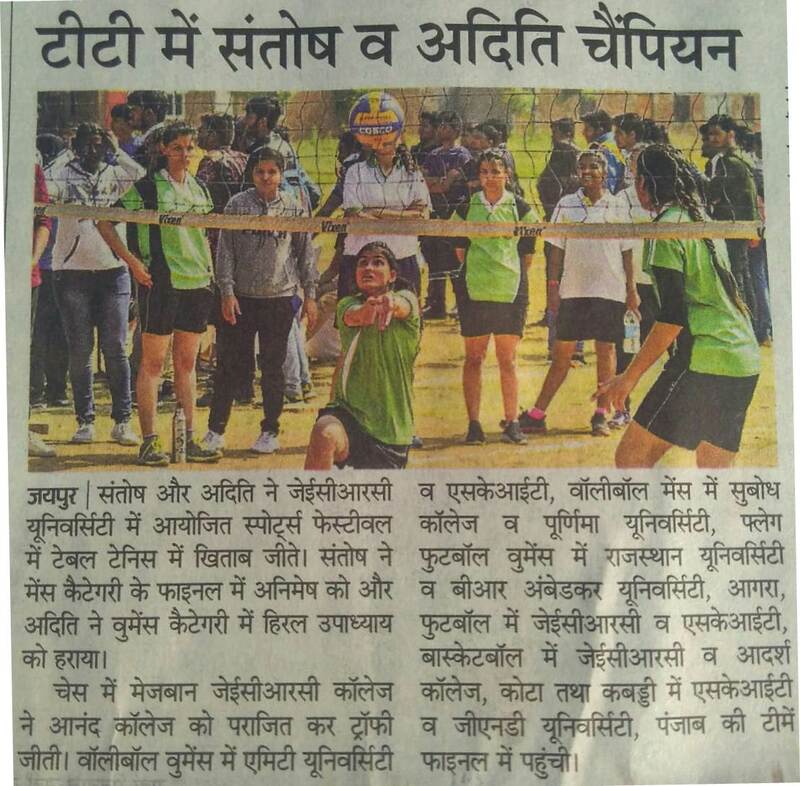 Date: 08 Mar 19 | Dainik Navjyoti. Colours of Youth in JU RHYTHM 2019 at JECRC University. Date: 08 Mar 19 | Daily News. Dance Fever Begins in Techno- Cultural- Business Fest named JU RHYTHM 2019 at JECRC University. 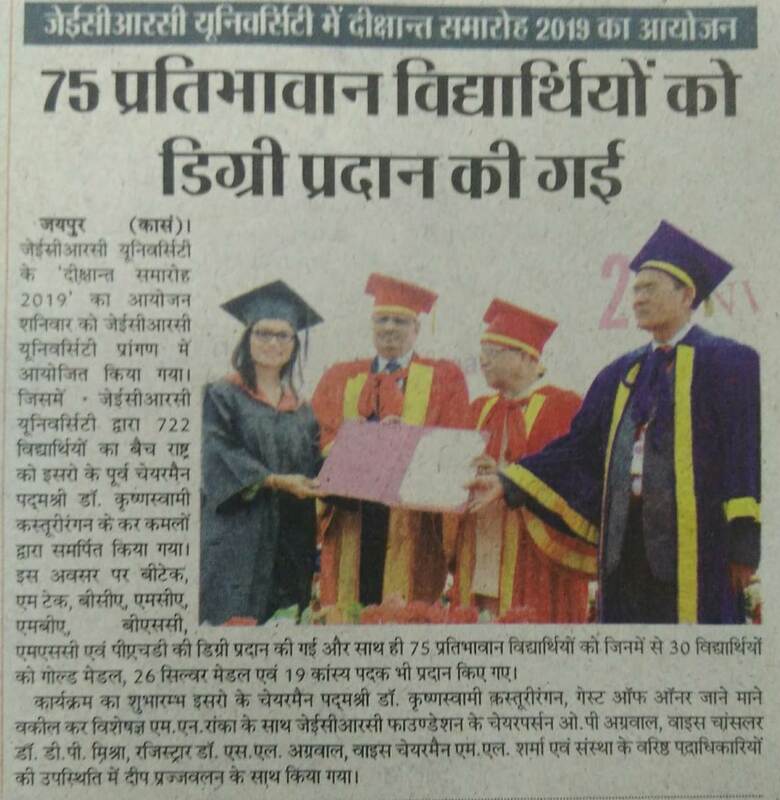 Date: 07 Mar 19 | Dainik Navjyoti. Techno- Cultural- Business Fest JU RHYTHM 2019 Started at JECRC University. 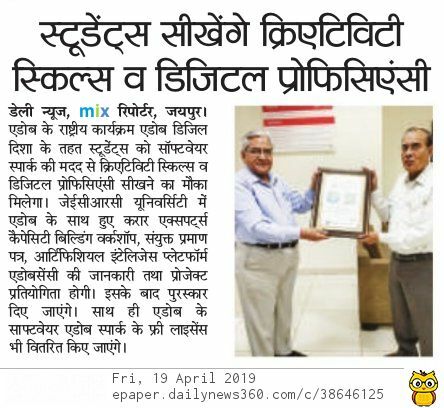 Date: 07 Mar 19 | Samachar Jagat. Date: 07 Mar 19 | Mahanagar Times. Blood Donars were Felicitated by 'Aashayein- The Life Saviour'. Date: 24 Feb 19 | Mahanagar Times. Smart India Hackathon (SIH'19) Grand Finale on 2nd and 3rd March at JECRC University. Date: 24 Feb 19 | Daily News. 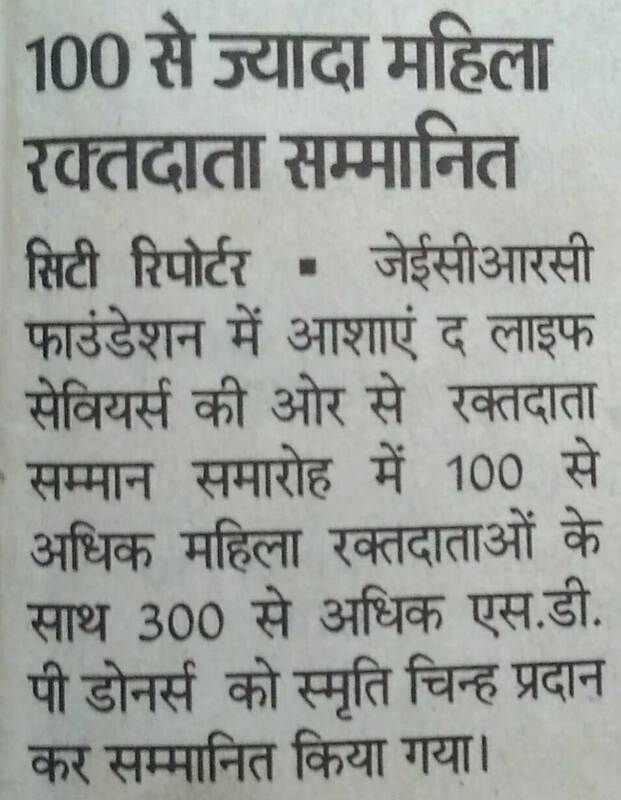 More than 100 Female Blood Donars Felicitated at JECRC. 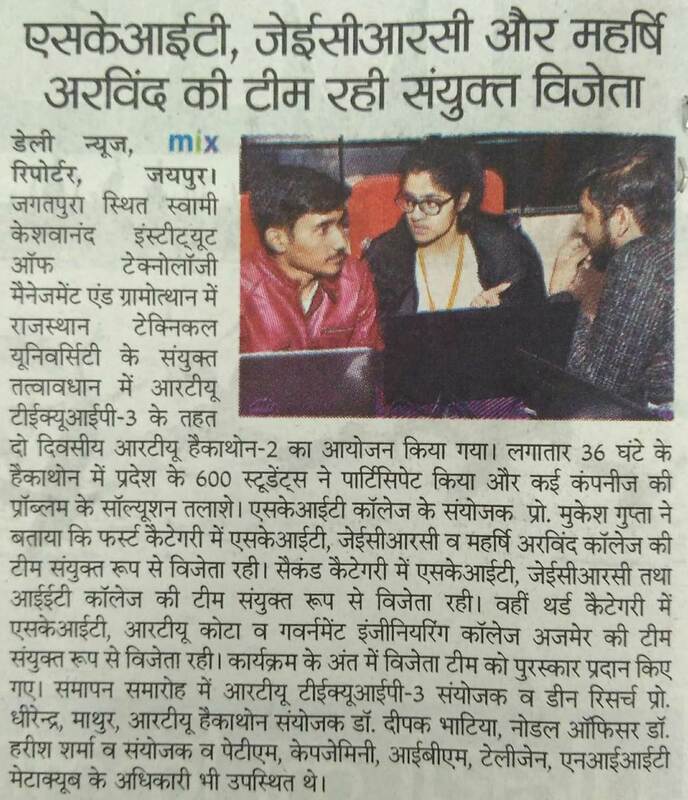 Date: 23 Feb 19 | Dainik Bhaskar. 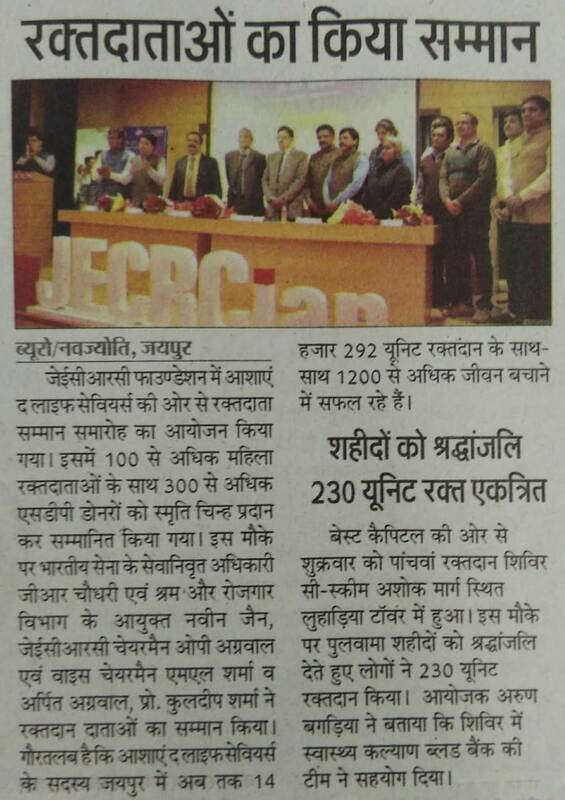 Blood Donars were Felicitated at JECRC. 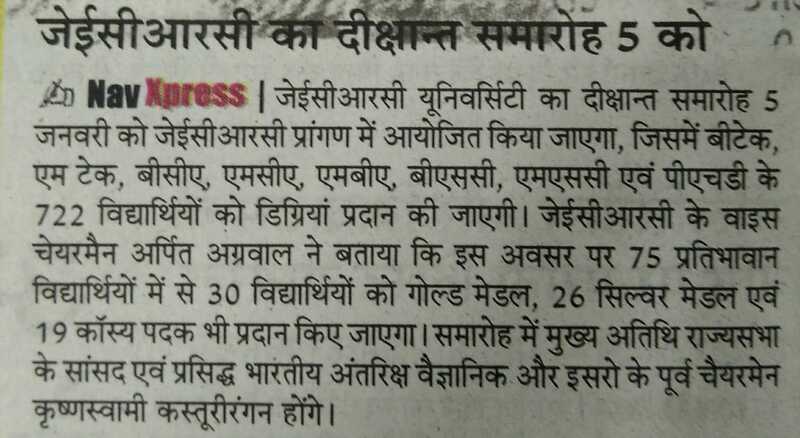 Date: 23 Feb 19 | Dainik Navjyoti. Blood Donars were Felicitated by 'Aashayein- The Life Saviour' at JECRC. Date: 23 Feb 19 | Samachar Jagat. Santosh and Aditi became Campions in TT in JU Verve at JECRC University. 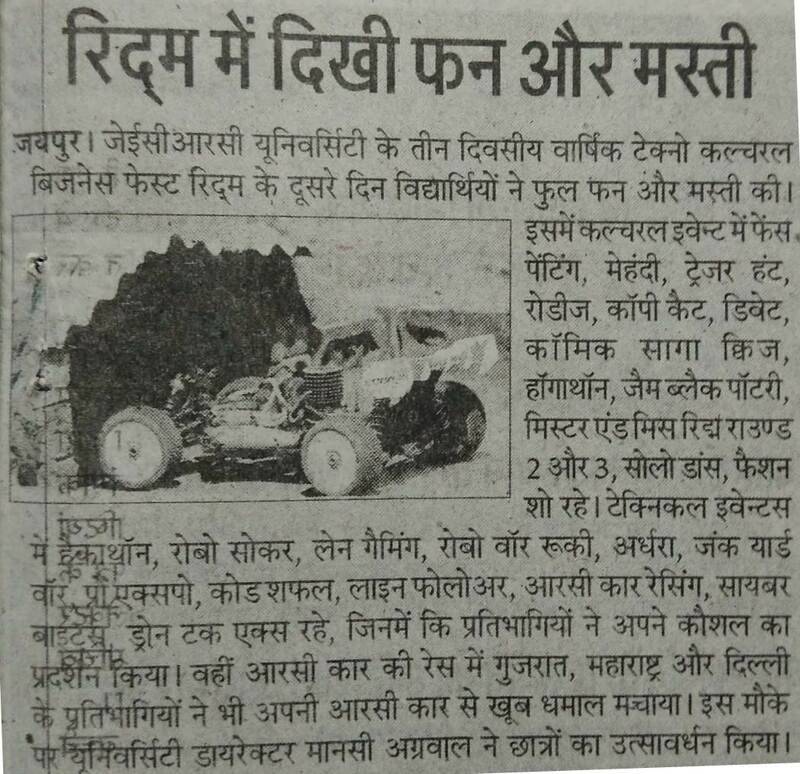 Date: 17 Feb 19 | Dainik Bhaskar. 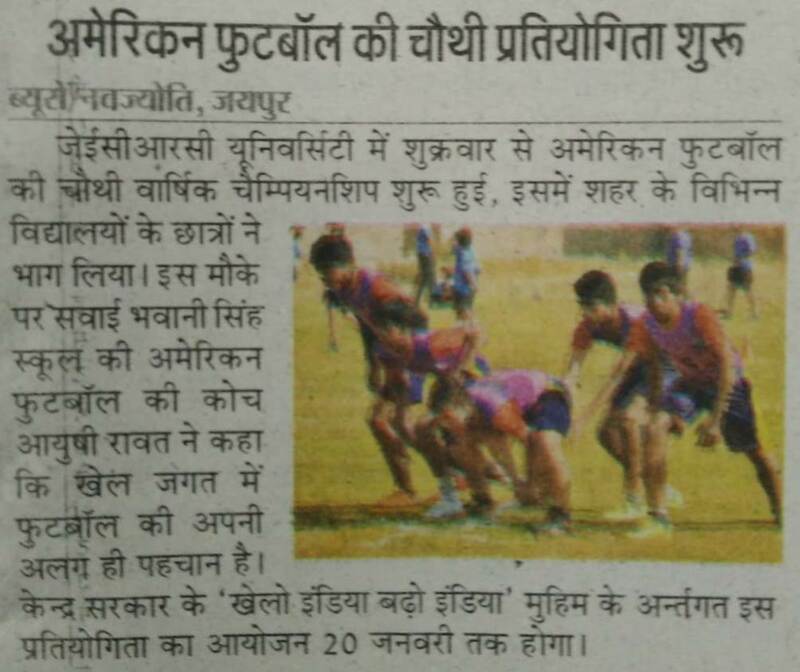 In National Level Sports Fest JU Verve saw Tough Competition between Players. Date: 17 Feb 19 | Samachar Jagat. 3 Days Sports Fest JU Verve Started at JECRC University. 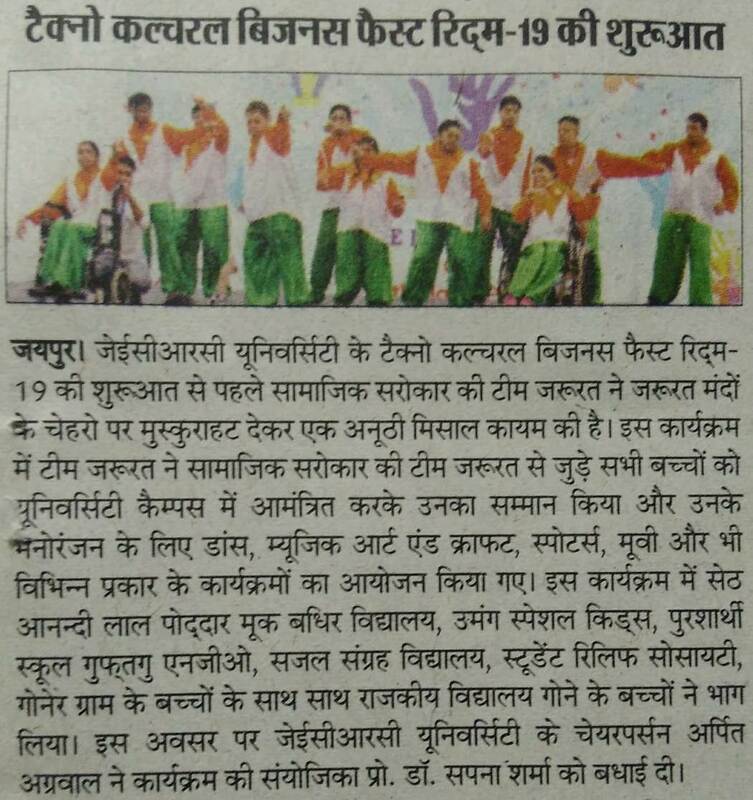 Date: 16 Feb 19 | Dainik Bhaskar. JU Verve- Sports Fest Started at JECRC University. Date: 15 Feb 19 | Daily News. 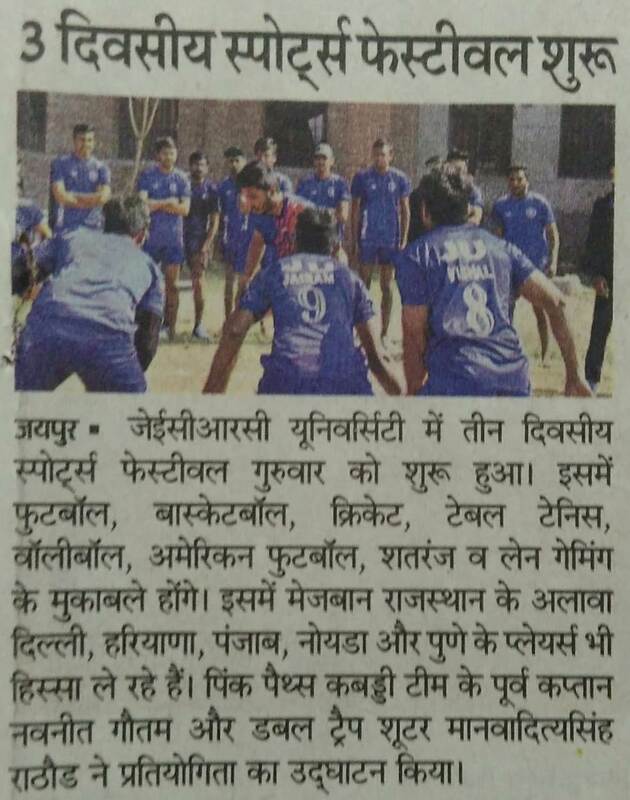 JU Verve- A National Sports Tournament Started at JECRC University. 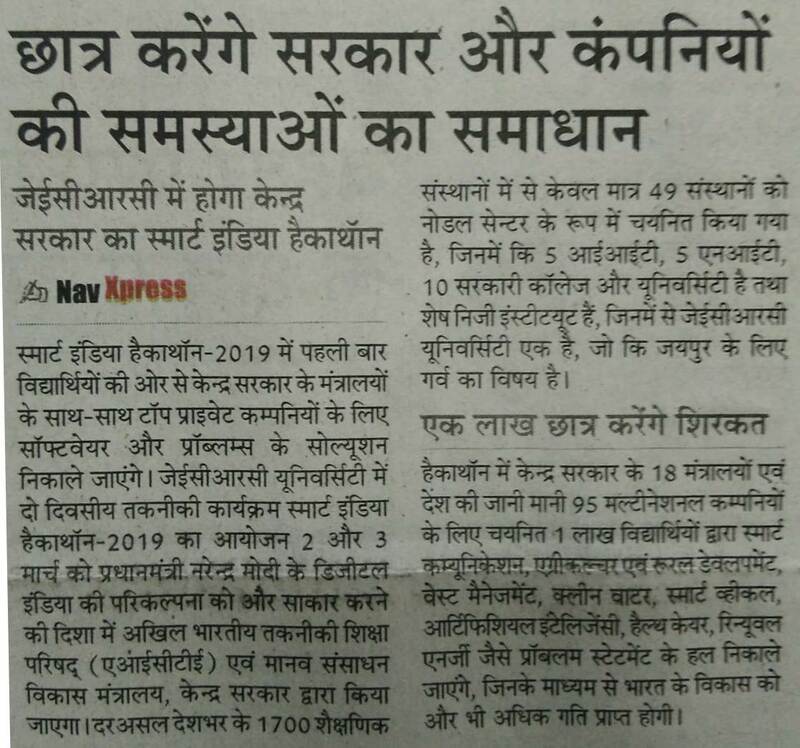 Date: 15 Feb 19 | Dainik Navjyoti. 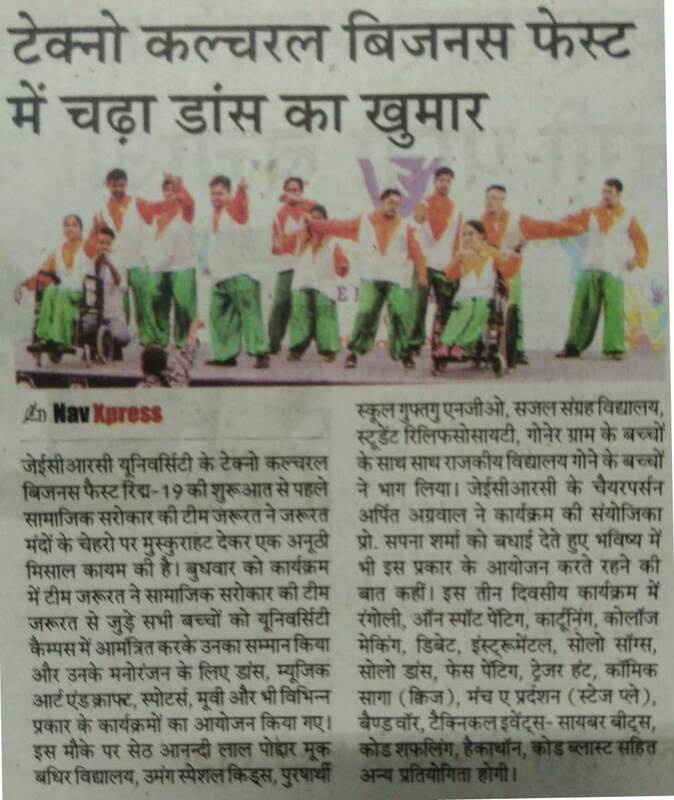 National Level Sports Fest ' JU VERVE' Started at JECRC University. Date: 15 Feb 19 | Samachar Jagat. 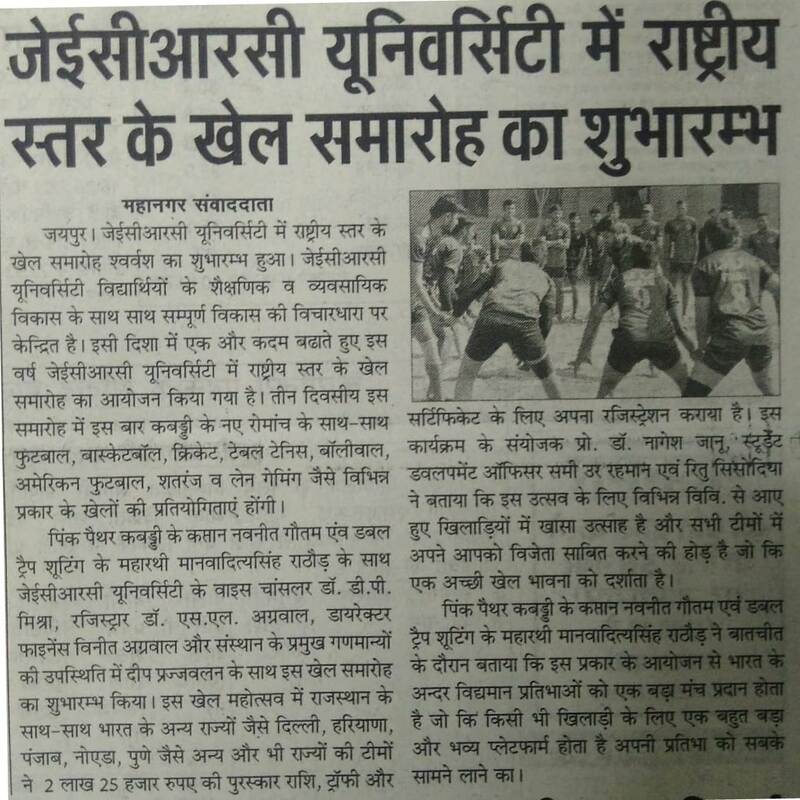 JU Verve- A National Level Sports Function Get Started at JECRC University. Date: 15 Feb 19 | Mahanagar Times. JECRC. SKIT and Maharishi Arvind Teams were the inclusive Winner. Date: 09 Feb 19 | Daily News. Smart India Hackathon (SIH'19) at JECRC University on 2nd March. Date: 09 Feb 19 | Mahanagar Times. Smart India Hackathon (SIH'19) at JECRC University on 2nd and 3rd March. 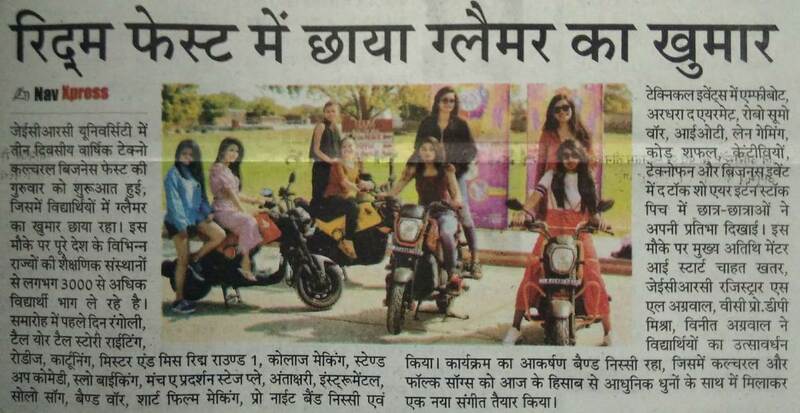 Date: 08 Feb 19 | Dainik Bhaskar. Students to Solve Problems of Government and Companies in Smart India Hackathon (SIH'19) at JECRC University on 2nd and 3rd March. 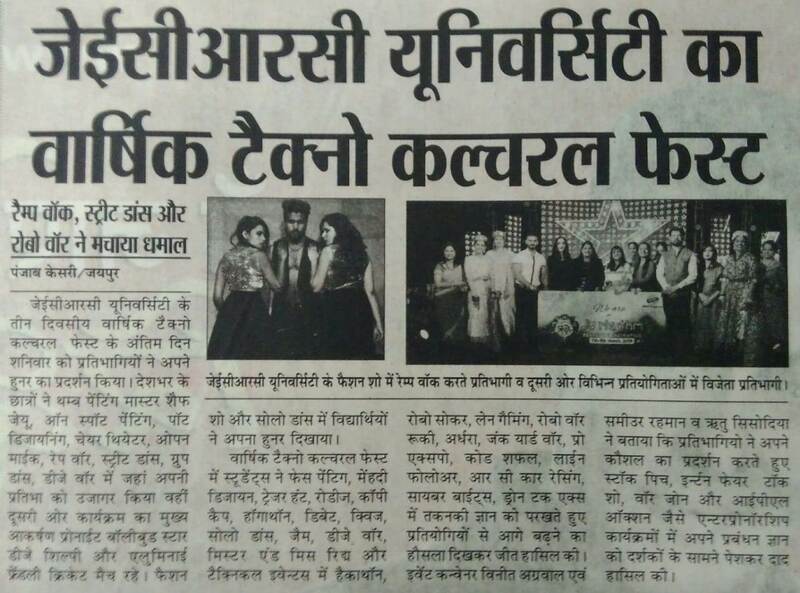 Date: 08 Feb 19 | Dainik Navjyoti. 'Smart India Hackathon- 2019' in JECRC University from 2nd March. 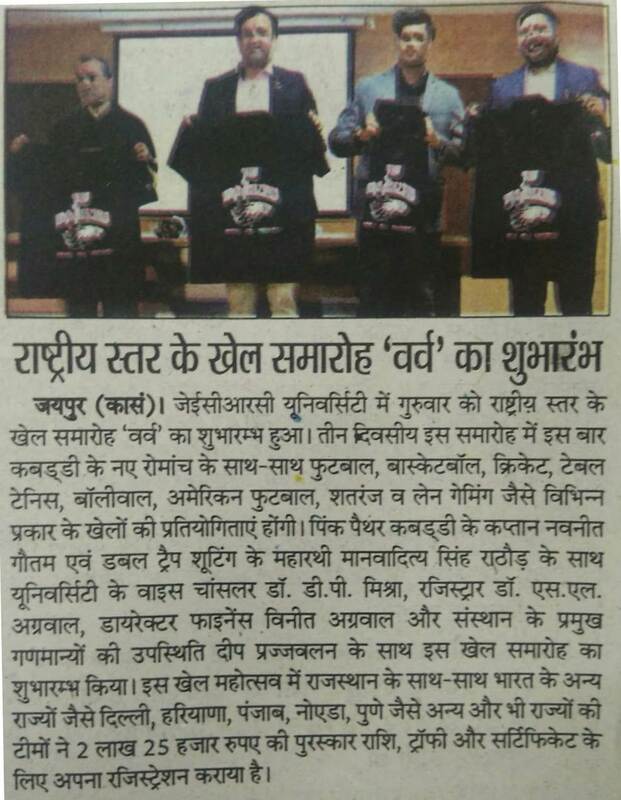 Date: 08 Feb 19 | Samachar Jagat. Students will Find the Solution for Companies in Smart India Hackathon (SIH'19) at JECRC University. Date: 08 Feb 19 | Daily News. 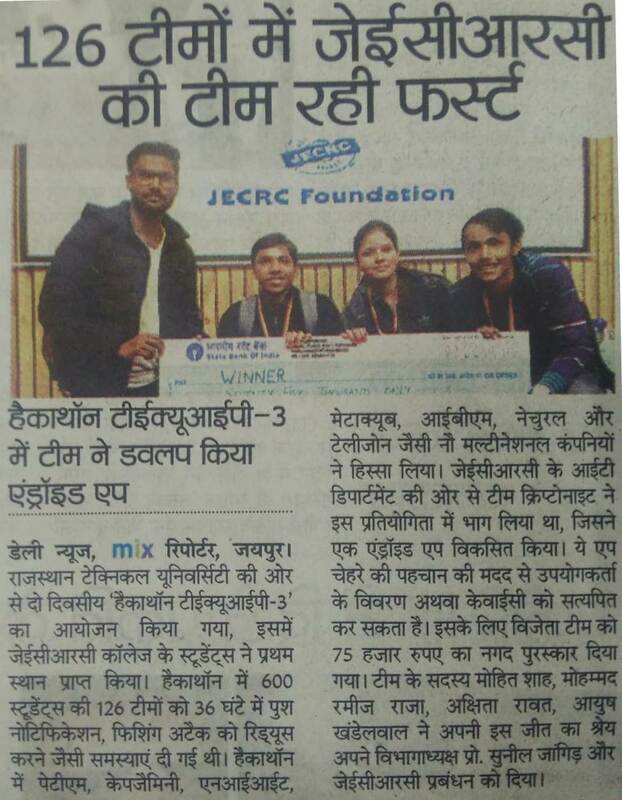 Team JECRC Won Frist Prize in Hackathon. 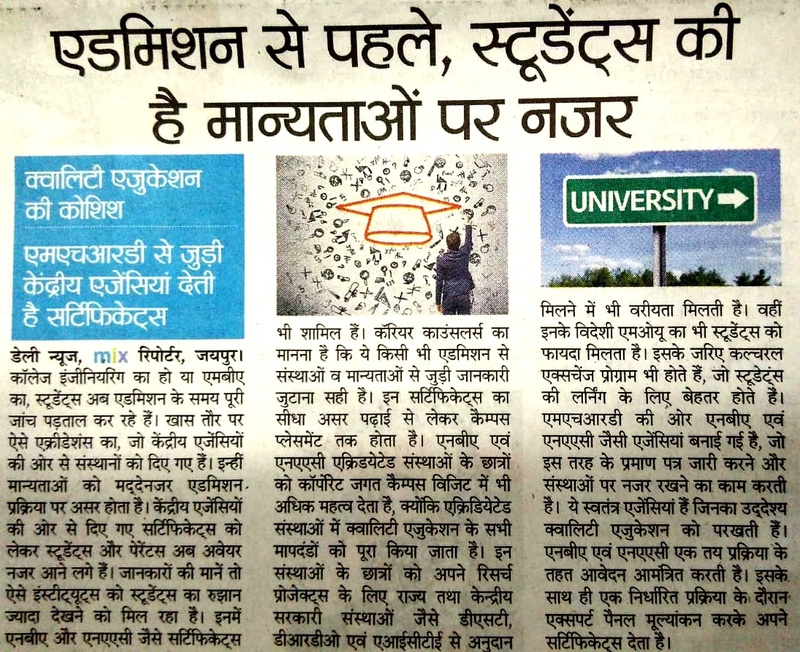 Date: 07 Feb 19 | Dainik Bhaskar. 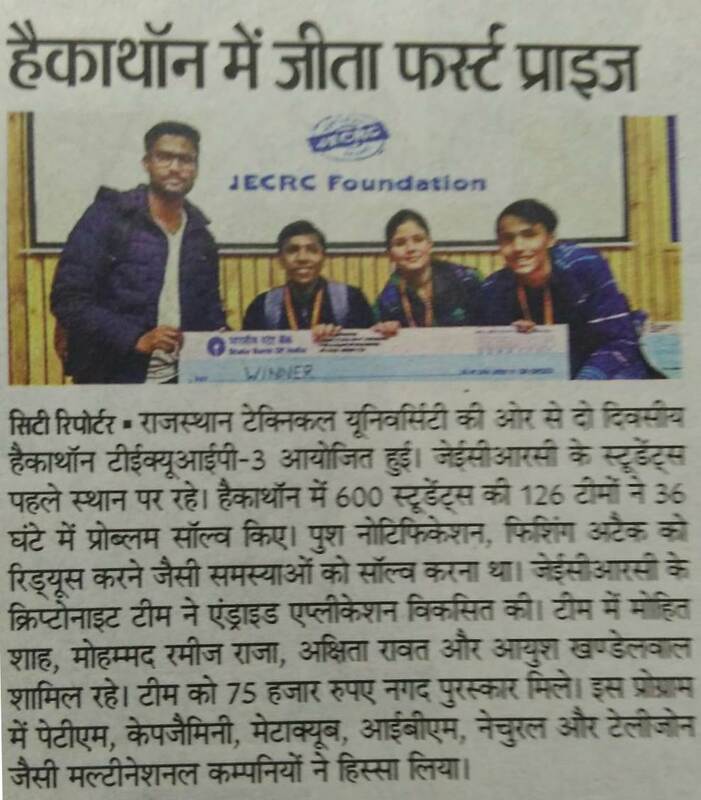 JECRC Team First Among 126 Teams. Date: 06 Feb 19 | Daily News. Students Made Face Reading App for KYC. 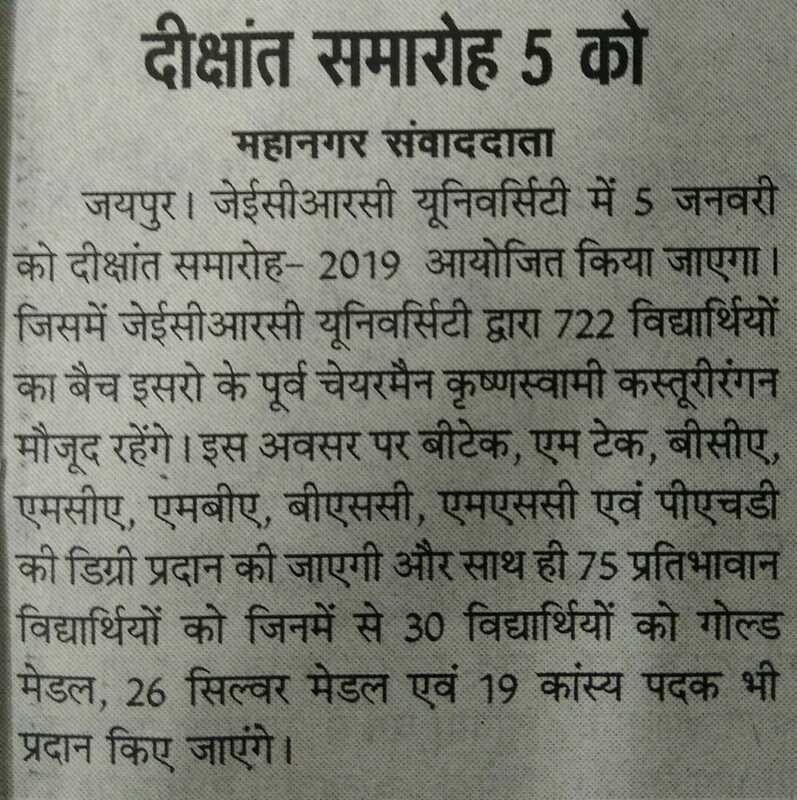 Date: 06 Feb 19 | Dainik Navjyoti. American Football School Championship Starts at JECRC University. 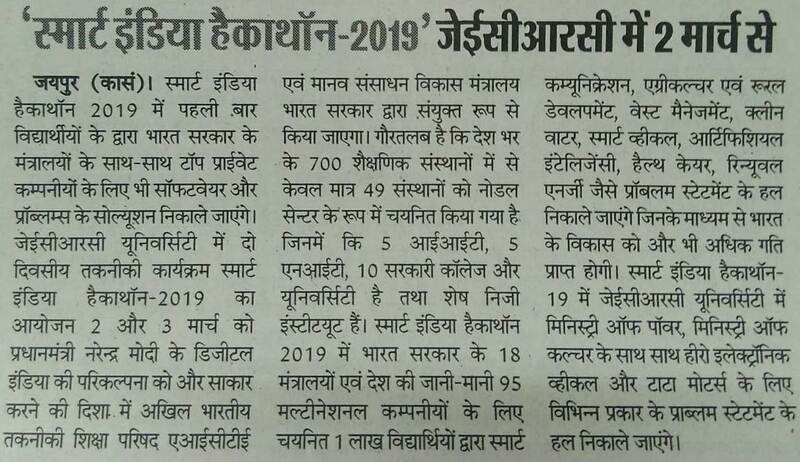 Date: 19 Jan 19 | Dainik Bhaskar. 4th American Football School Championship Starts. 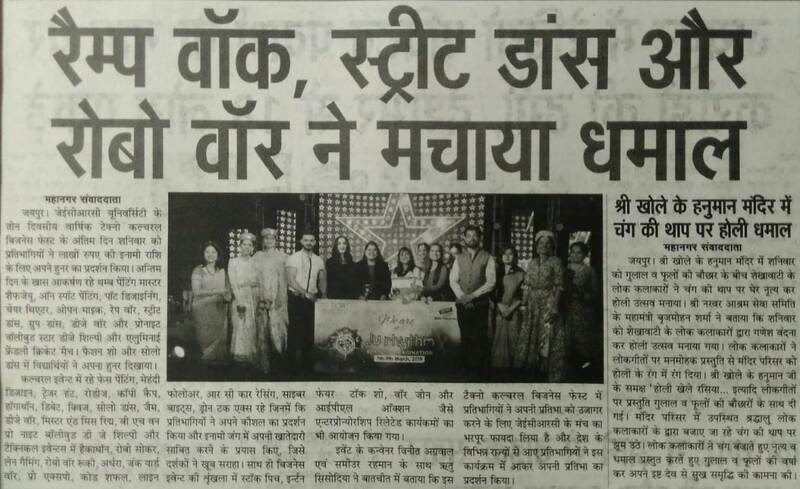 Date: 19 Jan 19 | Dainik Navjyoti. Championship Starts, Final on 20th January. Date: 19 Jan 19 | Daily News. 4th American Football School Championship Starts at JECRC University. Date: 19 Jan 19 | Samachar Jagat. Date: 19 Jan 19 | Mahanagar Times. 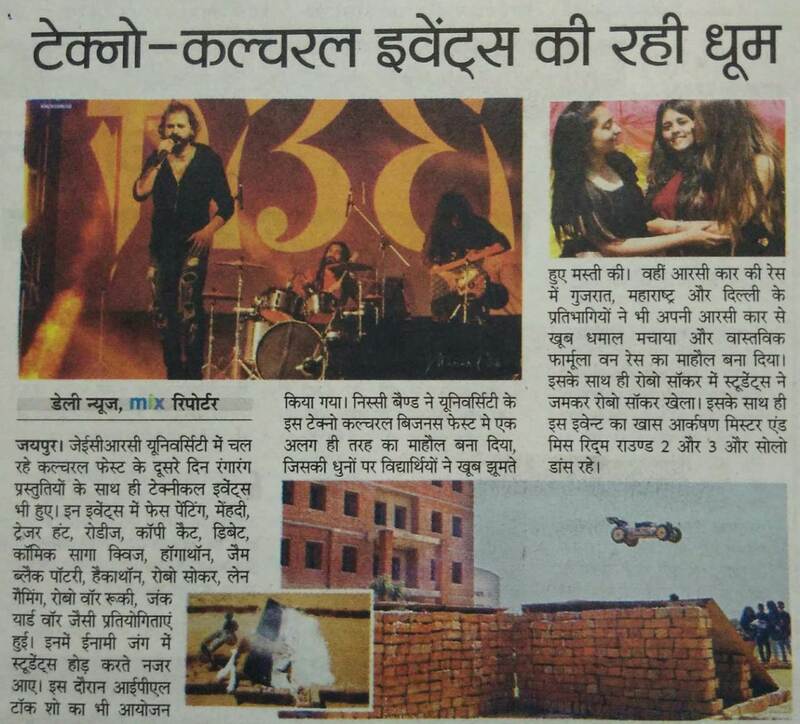 Date: 19 Jan 19 | Punjab Kesari. Association with ISRO is a Good Sign for Nation, Said Padma Vibhushan Dr. Krishnaswamy Kasturirangan in 2nd Convocation Ceremony @ JU. 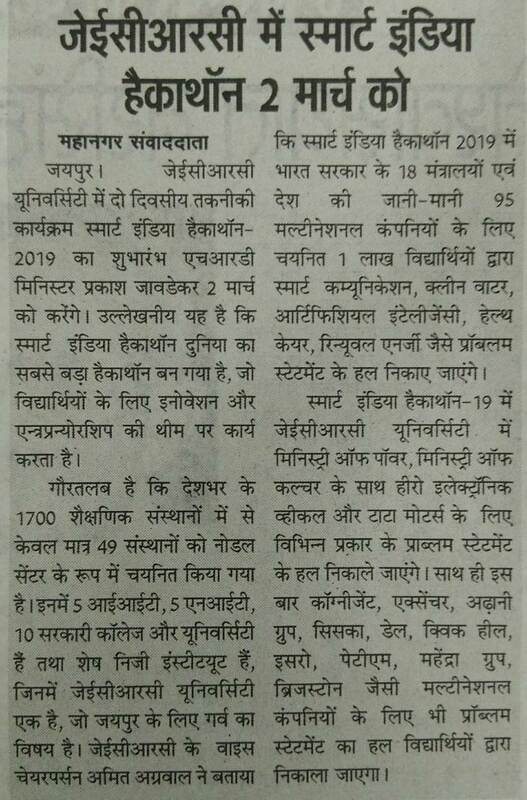 Date: 07 Jan 19 | Rajasthan Patrika. India is Providing The Best Engineers to the World. 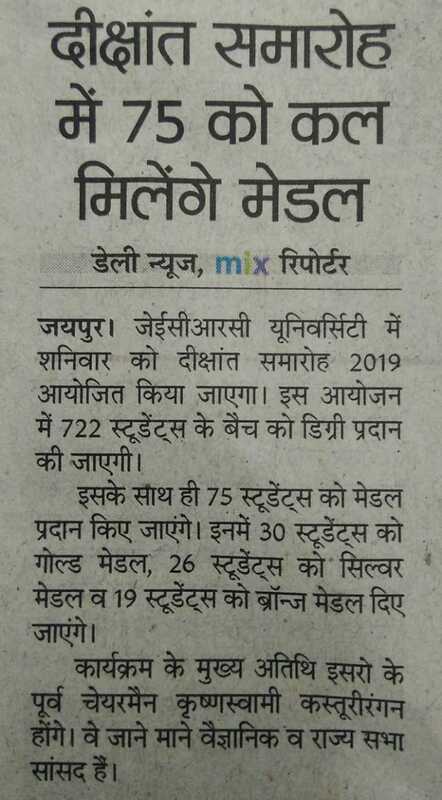 Date: 07 Jan 19 | Dainik Bhaskar. 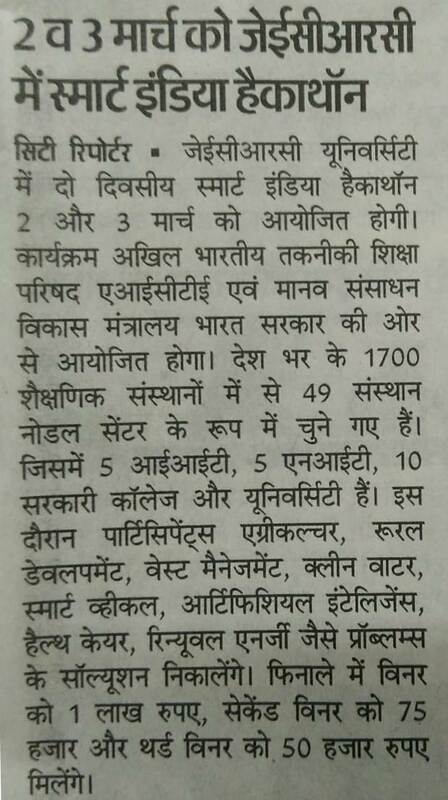 Association of IT Students with ISRO is Good Sign for Nation. Date: 07 Jan 19 | Dainik Navjyoti. 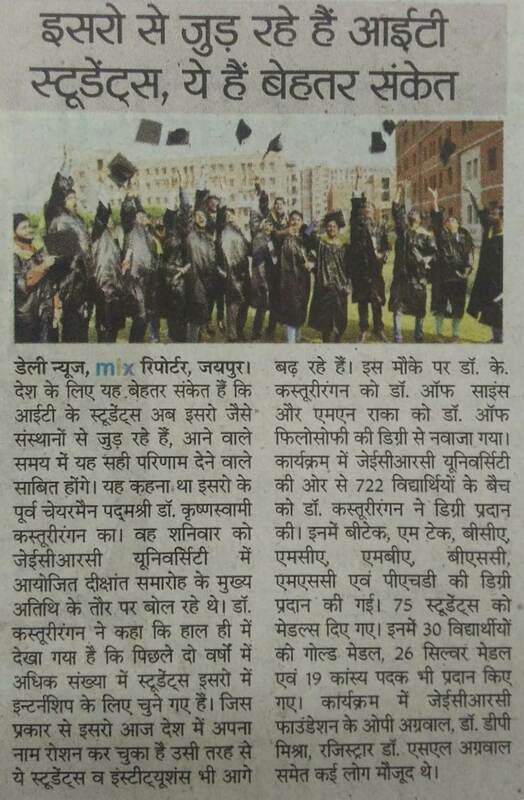 75 Students were Honored by Medals in 2nd Convocation Ceremony at JECRC University. Date: 07 Jan 19 | Samachar Jagat. 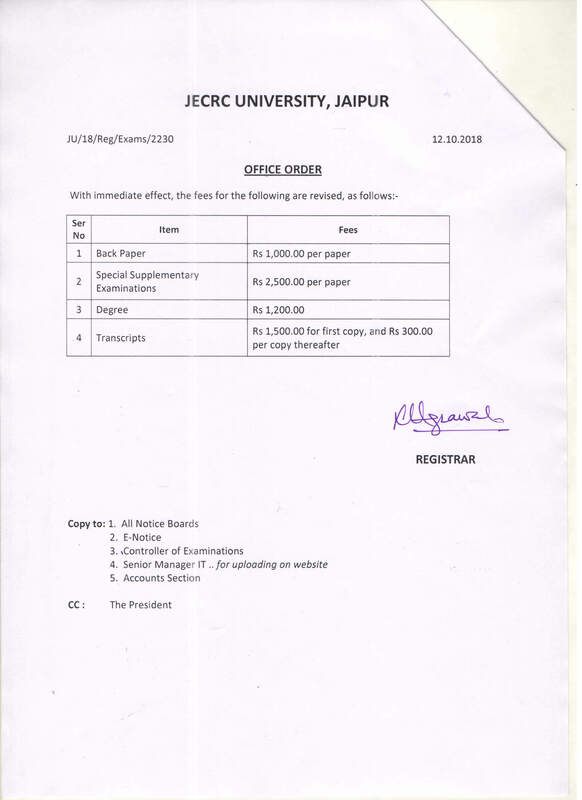 IT Students Associated with ISRO, This is Good Sign. Date: 07 Jan 19 | Daily News. 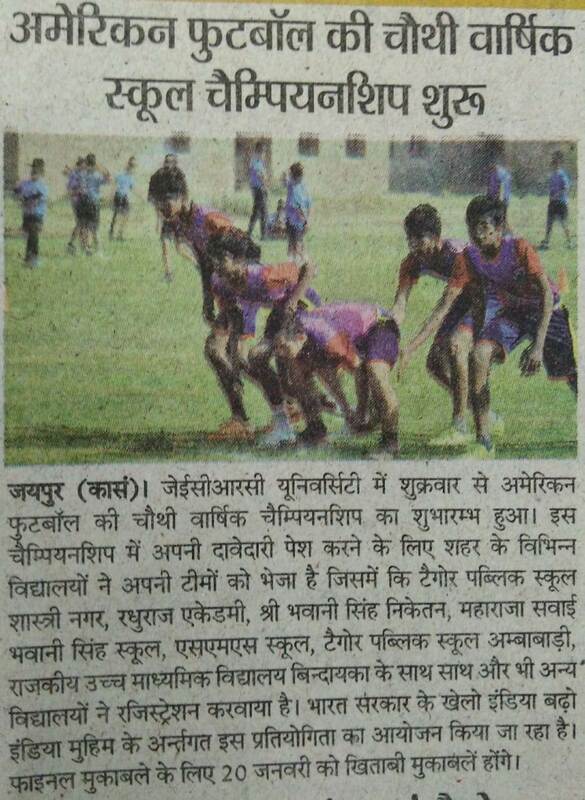 Date: 07 Jan 19 | Punjab Kesari. 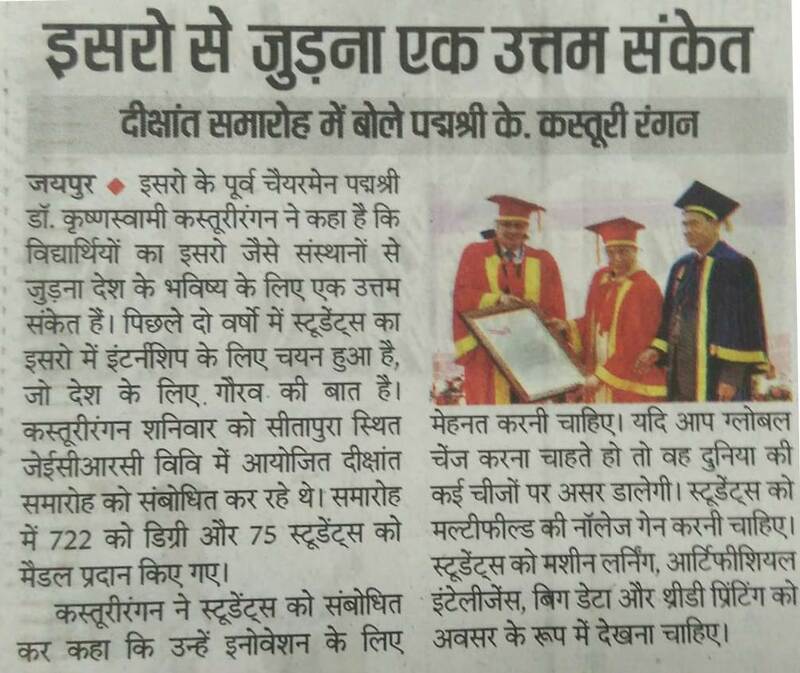 2nd Convocation Ceremony was held at JECRC University. Date: 07 Jan 19 | Mahanagar Times. 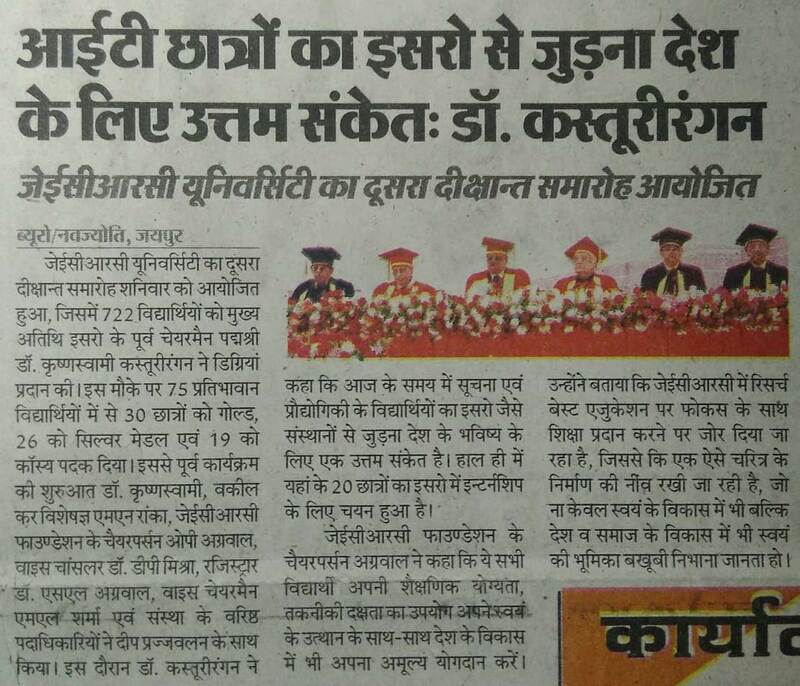 2nd Convocation Ceremony at JECRC University. 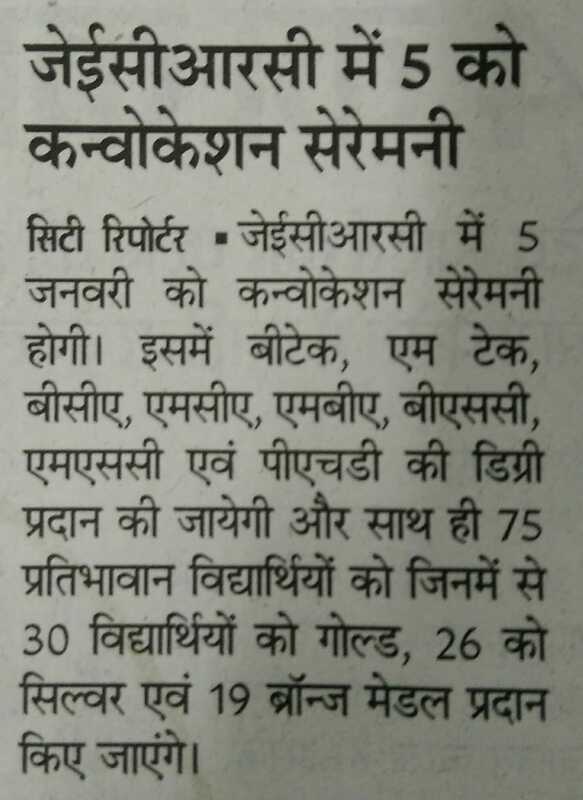 Date: 05 Jan 19 | Dainik Bhaskar. 2nd Convocation Ceremony of JECRC University on 5th January 2019. 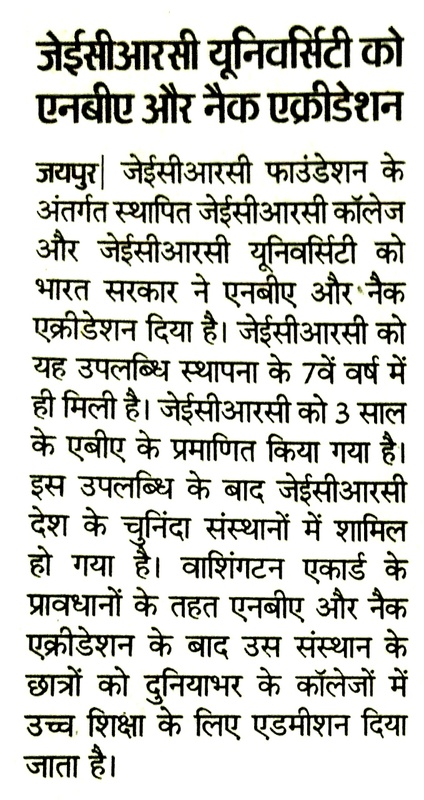 Date: 04 Jan 19 | Dainik Bhaskar. Date: 04 Jan 19 | Dainik Navjyoti. 75 Students will honored by Medals in 2nd Convocation Ceremony at JECRC University. Date: 04 Jan 19 | Daily News. 2nd Convocation Ceremony of JECRC University on Saturday, 5th January 2019. Date: 04 Jan 19 | Samachar jagat. 2nd Convocation Ceremony on 5th January 2019. Date: 04 Jan 19 | Mahanagar Times.